Tomato cages are essential to producing a great harvest of delicious, heavy fruit. It can be truly heartbreaking to grow a tomato from seed, transplant it, nurture it, watch the bees pollinate the flowers,and see the baby fruit begin to come through,only for the plant to collapse under the weight of its bounty! This article will show you all the ways you can use tomato support to keep your plants growing tall, strong, and fruitful. Tomato plants like a little room to spread out: they will grow wherever they can find support. A windy day can whip the fruit around, causing stems to tear or bend. If you're growing tomatoes in containers, then it's a good idea to ensure that they're in a sunny, sheltered spot. Tomato Plant Watering: keep them hydrated! Can you save a Broken Tomato Plant and bring it back to life? Links open in a new window, but you'll stay on Container Gardening For You. Why Are Tomato Supports Necessary? While tomato plants are strong in the main direction of the sap flow (up through the main stem), they are relatively inflexible. Their stems are prone to splitting if stressed, and the most natural form of stress is for the fruit to pull them away and downwards towards the ground. The problems don't end there. A tomato plant stem that survives the gradual process of being weighted down by its fruit can get leaf rot or fruit rot, because the tomatoes will rest on the earth, neighboring lawn, or other nearby plants. But how can we support the tomato plants and prevent these issues? Tomato cages, stakes and ladders can keep the plants from breaking under the weight of tomatoes. 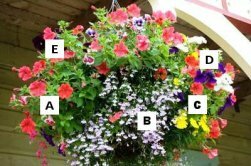 But there are so many types available: how does a keen container gardener decide which product to buy? The tomato support system you choose will depend on where you're growing your fruit. Growing tomatoes in pots? Unless the pot you bought is huge, you will be limited to conical cages with small footprints. These tend to be shaped like inverted cones, with prongs you push down into the soil. The top of these tomato cages spread out wider than the base, with cross-wire supports every six inches or so. The basic version of these tomato cages is simply low-grade metal, fused together at the joins. These aren't pretty, but they do the job for one or two seasons. Expect them to rust pretty quickly. Spending a little more on a higher-end solution will give you a nice-looking tomato cage (if you care about the appearance of your tomato supports! ), and while it costs a little more initially, you'll have a tomato ladder that will last for many years. Growing tomatoes in containers? You have much more choice. Unless you have a very small container, almost any tomato cage will be useable. You can even screw a tomato trellis to the back of the container wall, and train your tomatoes up and across it. Hydroponic tomatoes are a specialist topic, dealt with elsewhere on our site. Click the link to read more. Here are some great solutions for you. Each of these products is available with free shipping on Amazon. If you're a practical kind of person who enjoys the challenge of building things from scratch, or on a tight budget, then you can build your own tomato ladders or cages from virtually any scrap material you can lay your hands on. Tomato trellis conversion: You can reuse old trellis to make a tomato trellis. Cut the trellis with a saw to a width just narrower than the container with the tomato plants growing in it. Your challenge will be to fix the trellis to the back of the container strongly enough: very heavy tomato plants can break wooden trellis, particularly older wood. Either support the trellis with vertical wooden pieces (2 by 4 screwed into the base of the container should be sufficient), or position your container against a fence or wall, and screw the trellis into the wall or fence every six inches up. A simple tomato cage can be constructed from plastic piping or electrical conduit. Cut the plastic pipe to 5ft lengths (you'll need three for triangle-shaped cages, and four for square tomato cages). 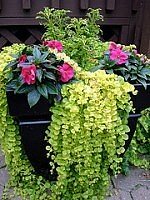 Push these 6 to 9 inches into the soil of your container. Secure cross-pieces of electrical conduit to create the ladder. The nice thing about this job is you can do it while the plant is already growing. Take care not to damage the plant roots as you push down the supporting pipes. Once each cross piece is secured, you can tie the tomato plant stems to the tomato supports using Luster Leaf soft ties, which are an excellent, waterproof flexible metal tie coated in plastic. We highly recommend Luster Leaf Soft Ties. 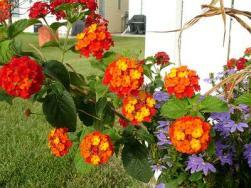 They're strong, won't fray or split, and won't damage the plant stems. There are different types for different uses, light, heavy and so on. Even container tomato gardeners on a budget should consider these, as they're a few dollars for 16ft of wire. Why be cheap here, where it really counts? Another great solution are tomato trellis clips. Here's our review. Creating a vertical garden is an excellent option for those gardeners lacking in space. Vertical tomato plants can be grown almost anywhere, even in areas with very limited space. If you're growing your tomatoes on a patio or rooftop, or indoors, then there are very few alternatives to going vertical. But vertical plants need a lot of support. There is a wide variety of products available to help you start a good garden trellis. One great example of is the David's Garden Tool Tomato Trellis Clips. Trellising is one of the most effective processes to a bountiful tomato harvest. The height can be adjusted into different levels, depending upon the need and preference of the gardener. As your tomato cage goes higher, you are also required to provide greater support for your plants. Do not gamble a good harvest with bad trellis materials. Settling for homemade alternatives might do the trick, but it will never be a safe option. Provide your plants stronger support and secure better and healthier harvest with David's Garden Tool Tomato Trellis Clips. This set of tomato cage clips from David's Garden includes a quick-release feature, to allow farmers and home growers alike to freely move the clips during the year as the plant's support needs change, and save them for next year's season. The clips can go around stems with a three-quarter inch diameter. It can also be used on cucumbers, and other vine crops. 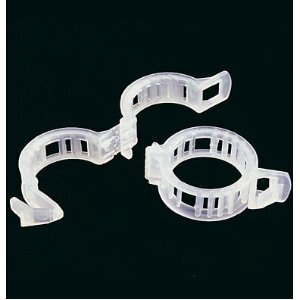 Provide strong and reliable tomato cage support for your climbing plants and save more garden area with these David's Garden Tool Tomato Trellis Clips. Your very own vertical garden is bound for a delicious harvest with just a pack or two of this product. 75 clips works out to about 15 cents apiece. They should last for five years or more, so that's about three cents per clip per harvest. A bargain, even if they save just one nice tomato plant per container garden! Avoid cheap tomato support solutions. Garden string may cut into the tomato plant stem after you attach it to your tomato cage, particularly when it really matters later in the season, as the weight of the fruit puts stress on the plant stems. 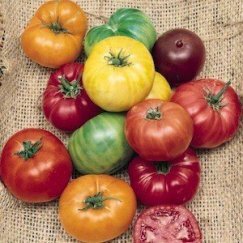 String will also rot when it gets wet: breaking string, or too-weak tomato stakes, is the number one reason that tomato plants fall over just when you need them to be at their strongest. They may look nice and natural, and very thick bamboo canes are extremely strong, but in general, bamboo canes are a bad tomato support system. Remember that your tomato trellis needs to be at its strongest during the final weeks of the fruiting season. Deficiencies in bamboo cane supports won't become apparent until it's too late to do anything. When a bamboo stake gives up the ghost, your tomato plants will be in a heap on the ground, their stems will be compromised, and your crop will be drastically reduced, if not totally lost. There are modern versions of bamboo canes for gardeners who prefer this method to tomato cages or ladders. The best-known is simply called The Tomato Stake. It's stronger than bamboo, and the nicest feature is its built-in twist ties to secure the tomato stems directly to the stake. If you insist on staking tomatoes, then we can only really recommend The Tomato Stake. It's the only tomato stake solution that is reusable year after year. You may find that the tomato plant overwhelms the stake, as it has nowhere to grow laterally, so all its energy will push it taller and taller. Bamboo canes don't last: the main issue with staking tomatoes using bamboo poles is longevity. A strong-looking support during the middle of the season will bend and split, and you'll probably end up staking tomatoes two or three times per season. Tomato ladders are another form of tomato support. These tend to be made of metal, and the most successful in our experience are the ones with multiple rings, “stacked” one of top of the other. These rings form the tomato ladder, giving the plant room to move laterally around the rings, as well as the strength the stems need to support the weight of their fruit come harvest time. Spiral ladders: There is another kind of tomato ladder, in the form of a spiral like a large spring. Reviews of this product are so mixed that we hesitate to recommend it. 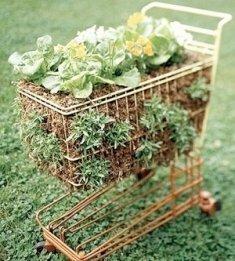 The most obvious problem is, when you're looking for tomato cages, you want an all-in-one solution. The spiral tomato ladders are not a complete fix. You need a stake of some kind to support the spiral rings. This surprised us as much as the customers who bought it and were disappointed. Here are some great how-to videos on making and using tomato cages. Do you have any tips on tomato cages, ladders and other tomato support ideas? Please share them using this simple form.